In the two weeks since we arrived at base camp, we have been up the mountain twice on what are known as “rotations”. These involve climbing successively higher up the mountain each time to get the body used to the altitude ahead of the final push for the summit. Base camp. The view from near my tent. The first rotation was to Camp 1. This was my first trip through the notorious Icefall, one of the more dangerous parts of the climb. The Icefall is a tumble of ice blocks – a place where a river of ice drops over a cliff, splitting and breaking like a Snickers bar bent in half. There are crevasses opening like gashes. There are looming ice cliffs and tumbling blocks. The glacier is always moving imperceptibly. And through this subtly-changing landscape a narrow path weaves and climbs. Aluminium ladders are lashed together and strung out over unskirtable crevasses. Going up is tiring, particularly the first time. The air is thin. Over-exertion – which may be as simple as hauling oneself up three icy steps – can lead to moments of unpleasant gasping and deep-breathing. The first time I went up through the Icefall was hard. 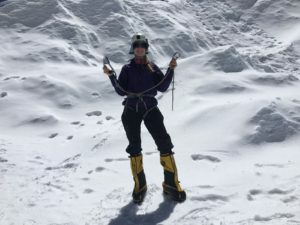 I had not armed myself with snacks and water in accessible pockets and since we didn’t really stop at all – we want to get through the dangerous part as quickly as possible – I didn’t eat or drink for maybe six hours. I was exhausted when we finally reached Camp 1. I had a rest day the following day while other team members made an excursion to Camp 2 and back in the morning. Since Camp 1 is a small camp with no cooking facilities, I spent most of the afternoon melting snow into water for drinks and food. It’s a slow process. We all descended back to Base the day after. On my rest day, I was able to appreciate Camp 1’s surroundings. After the Icefall, the glacier flattens out into the Western Cwm, a hanging valley at around 6,400m. There are still crevasses to watch out for, and some large undulations like huge waves in the snowy terrain around Camp 1, but the glacier is calmer. Back at Base Camp we had welcome showers and washed clothes. I did some filming for my Everest video series. Otherwise we rested and ate and drank – very important here! After a couple of rest days, we headed back up the mountain. I spent a night at Camp 1, then walked to Camp 2 the next day. 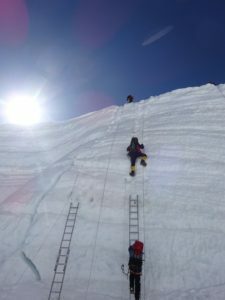 The walk up the Western Cwm to Camp 2 is not too arduous – after climbing an ice wall and crossing a couple of ladders over crevasses it is a simple walk, and it is possible to get into a good rhythm. But it is incredibly hot! The temperature variations in the Western Cwm are extreme. Before the sun hits, or when obscured by cloud, it is very cold (perhaps -10 to -20°C), but when walking in full sun in Gore-Tex it can be sweltering. The surrounding snow and ice reflects the sun’s rays so you are hit from all directions, almost as if the Cwm were a solar concentrator focussed on the weary climbers. Layers come off, thick gloves are changed for thin, sunhats and sun-cream are essential. But the air temperature doesn’t change with the sun up here. In the shade it is still freezing. Or if the clouds come in suddenly, it is as if the sun were never out at all. There is no happy medium. We spent a few nights at Camp 2 with a couple of rest days to allow bodies to acclimatise. 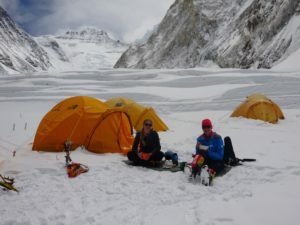 Camp 2 is also known as Advanced Base – it is much bigger than Camp 1 and teams have kitchen facilities and cooks, so at least food is not something we need to worry about. One day we made a trip to the Lhotse face and up the first few of the steep pitches towards Camp 3. I would have liked to go all the way to Camp 3 but it was not to be. Another rotation will be necessary. But it was good to get to the Lhotse Face and see what was involved, to feel that it is ok. It is a steep climb – not vertical ice but steep enough. There are fixed ropes that we haul ourselves up with jumars (devices that can be pushed one way but not the other, so they grip). 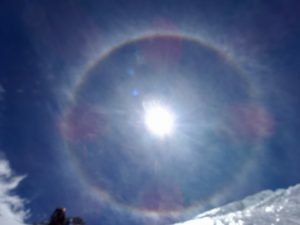 As we were climbing the clouds blew out and we saw the most beautiful rainbow halo around the sun. Now we are back down to Base Camp. It’s a relief. It is hard work up there. Even “rest days” aren’t really restful. 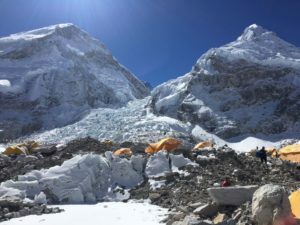 The extremes of temperature make it uncomfortable; the altitude means that it is easy to become out of breath when walking around camp, or even going to the loo! Everything takes more effort than it would do lower down. However, we are able to experience an incredible environment that is open to so few. The ice is beautiful – the way it twists and cracks and shines is lovely. The clouds move in and out so quickly, they hug the slopes and create beautiful atmospheric effects. On the days that you don’t push your body to exhaustion you can appreciate the amazing nature of the place. It is magnificent.